In his very helpful book, Deep Preaching, J. Kent Edwards urges the preacher to take God’s Big Idea into the closet and allow the Spirit to work there for the sake of deeper preaching. So true. This place doesn’t need to be a closet (it’s hard to find one humans can fit in in some cultures!) It does need to be a place without study resources and Bible software and shelves of books, not to mention phones and email and satellite whatevers. It might be an extended walk in the woods, or a chair in the lounge, or even, one of my favourites, the empty church where the message will be preached. What is the goal here? The goal is to spend focused time in fellowship with God concerning the preacher, God, the passage and the listeners, in order to be able to then prepare a targeted message for them from that passage. Where is the focus? God was certainly involved in the study, at least, He should have been. But it is important to recognize that the preacher is not primarily a purveyor of ancient wisdom. The preacher is, or should be, in fellowship with the Living God. So the step isn’t from commentary to outline, but from study to focused prayer. 1. Preaching should involve enthusiasm for the text and what you have discovered, but it should be driven by who, rather than what. Prayer closet time allows that personal connection and responsiveness to the God who reveals Himself in the Word to develop and drive the preaching. 2. Preaching should involve awareness of the meaning and impact of the text, but it should be sealed on the heart and experience of the preacher, not just held at arms length as new discovery. Time in prayer allows God’s Word to be driven deep into our hearts. 3. Preaching should involve a message carefully crafted to communicate effectively to a specific audience, but for that to be an act of real love, then God’s heart for the people needs to be our heart for the people. Bringing the people before God, alongside the passage, is thus critical to forming and delivering a message as an overflow of God’s love for them. More could be written, but let’s leave it there. Study. 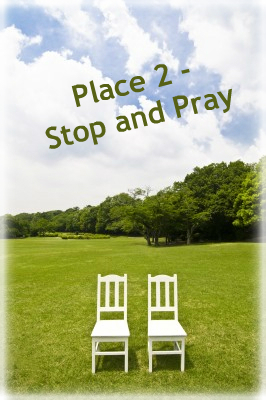 Then stop and pray. Then? Some people will be very excited by the next location!